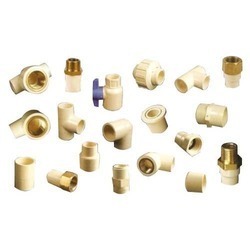 Pioneers in the industry, we offer cpvc pipe fittings from India. CPVC material for manufacturing Hot & Cold Application pipes, CPVC Pipes Fittings and CPVC Ball Valves is considered as most suitable. It has vide market throughout the globe as conventional Valves, pipes and fitting made of conventional materials like GI Pipes etc. have become outdated as CPVC products have many advantages over them. Hot & Cold water Distribution is residential, Industrial and public project.